Intellectual property issues in the film industry are often highly complex and in today's world are evolving rapidly. In this second edition of Film Copyright in the European Union, Pascal Kamina unravels the complexities of film protection in twenty-eight member states of the European Union, including thirteen new member states who have joined since the first edition. 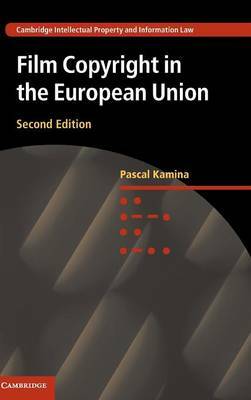 As well as addressing key aspects of film copyright, Pascal Kamina also deals with the protection of film works within the European Union in the context of European harmonisation of copyright laws. Including a new chapter on copyright enforcement, this second edition details the substantial developments in EU law during the last decade, including major cases for the European Court of Justice, new treaties and new directives. This book will interest practitioners, academics and students. The developments on contracts and moral rights will be of particular interest to lawyers outside continental Europe.